Can My Boy Jack get into the Kentucky Derby through the Lexington Stakes? The 18th running of the Grade 3, $100,000 Sham Stakes awards points in the Road to the Kentucky Derby system. 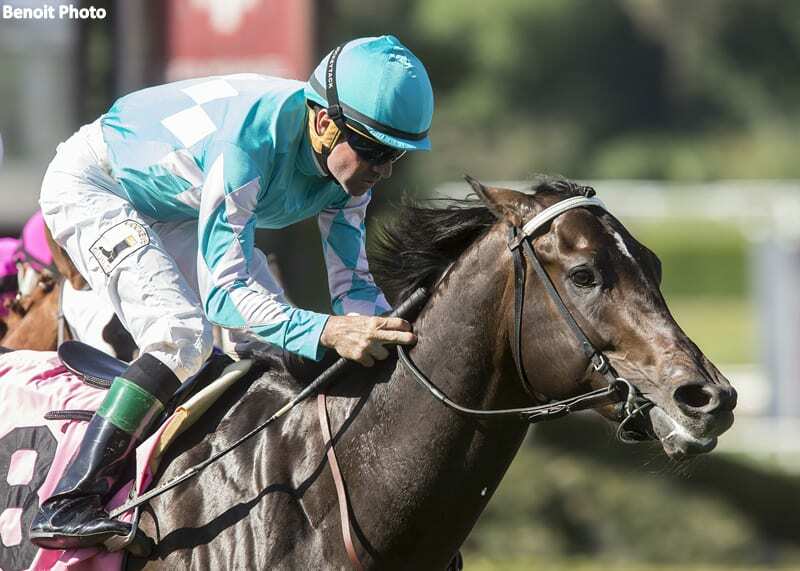 It also gives many racing fans a look at some of the horses on the West Coast we may be expecting to see over the next few months in the lead up to the Santa Anita Derby in April. This year's edition of the Sham brings together a field of seven, four of which have won or placed in stakes races in their brief careers to date. Leading that list is McKinzie, who finished second in the Grade 1 Los Alamitos Futurity last month before being moved into first via a disqualification. Another with stakes credentials is Mourinho, who hails from the barn of Bob Baffert just as McKinzie does, and who finished second in the Grade 3 Bob Hope Stakes in his most recent race. My Boy Jack won the Zuma Beach Stakes last fall on turf and has a shot if he can transfer that form to the main track. Similarly, City Plan won the Gold Rush Stakes on the all-weather surface at Golden Gate Fields last month and is hoping to duplicate that form at Santa Anita. Strong recent maiden winners Shivermetimbers and All Out Blitz have potential to move up in class and run well as many three year olds do at this time of year. Here Is Happy, sixth and beaten 19 lengths in the Bob Hope, rounds out the field. My Boy Jack has the most experience of any of Sham Stakes entrants, having run six times. He has only won once, that win coming in the Zuma Beach Stakes last fall on the turf. In the Zuma Beach, My Boy Jack rallied from eighth of 10 in the early stages and four paths wide into the stretch to earn a career- best 102 Equibase Speed Figure. His next start came among some of the best young turf horses in the world in the Breeders' Cup Juvenile Turf, in which My Boy Jack was beaten just three lengths in a 14 horse field and in spite of his jockey having dropped the crop with an eighth of a mile to go. In his career debut last June, his only previous start on dirt, My Boy Jack ran poorly and finished sixth. However, My Boy Jack has come a long way since and is bred to run just as well on dirt as he has recently on grass. His sire, Creative Cause, produced two strong stakes runners as three year olds last year – Twisted Tom (seven for 10) and Pavel (two for six). Additionally, the team of trainer Keith Desormeaux and his brother, jockey Kent Desormeaux, have done very well over the past two years, winning at better than a 25% rate in dirt routes. Over the past five years, the Desormeaux brothers have had some exceptional young stakes horses such as Texas Red (Jim Dandy Stakes winner in 2015) and Exaggerator (Haskell Invitational Stakes winner in 2016). As such, I have every bit of confidence the team behind My Boy Jack will have him ready to run a winning race to start his three year old season. Shivermetimbers tried two-turns for the first time in his third career start in November and earned his first win in very game fashion. In that race, Shivermetimbers battled head-and-head from pretty much the moment the gate opened until the wire, earning a 100 figure. Since then, Shivermetimbers was flattered when the runner-up from that November 23 race came right back to win his next race. Even though Shivermetimbers ran on or near the lead from start to finish in that race, his Equibase pace figure of 88 in combination with his final time figure of 100 suggests he does not the lead to win, a fact supported by his rallying finish from ninth to third in his career- debut in October. With it highly likely Mourinho, who is stretching out to two-turns for the first time and adding blinkers, will set a very fast pace as he will be challenged early by All Out Blitz (who is also stretching out), Shivermetimbers could be in a perfect stalking spot to post the upset in this year's Sham Stakes. McKinzie will go heavily favored in the Sham just as he was when the prohibitive 1 to 2 favorite in the Los Alamitos Futurity, in which he finished second but was placed first via disqualification of winner Solomini. McKinzie won in his career- debut on 10/28 powerfully with an incredible 116 figure which is better than the 113 figure Breeders' Cup Juvenile winner Good Magic earned one month earlier but that may have been a fluke as he regressed to a more reasonable 106 figure in the Los Alamitos Futurity. Nevertheless, only one other horse, Mourinho (107 figure when second in the Bob Hope) has run as fast or faster than McKinzie to date. After being passed in the late stages of the Futurity, blinkers come off McKinzie in the hope he will fight in the late stages and that could certainly help his chances to win his third race in a row. The rest of the Sham field, with their best Equibase Speed Figures, is All Out Blitz (103), City Plan (90), Here Is Happy (92) and Mourinho (107), the last of which can be considered for second on any exacta tickets played as that was where he finished in his two most recent races. This entry was posted in Horseplayers and tagged Ellis Starr, equibase, equibase analysis, Handicapping, Horse Racing, horseplayers, sham stakes, thoroughbred by Ellis Starr. Bookmark the permalink.